Don’t get me wrong. I love this new photo. Dawn snapped it from its second mapping orbit from 2,700 miles up on June 6. The number of craters and the detail visible in the parallel troughs snaking through the scene are breathtaking. That’s why I hate to niggle about the white spots. While they appear larger and sharper than images taken in May from a greater distance, they’re too bright to show much new detail. I can’t help but wonder if mission scientists might adjust the exposure a bit the next time around. When photographing bright objects here on Earth, we expose “for the highlights” or the bright areas in photos to avoid overexposure and loss of detail. Naturally, when you try to capture details in something bright, your background will go dark. But that might be what’s needed here – a change in exposure to reveal more detail in the spots at the expense of the landscape. Doubtless NASA will release enlarged and detailed images of these enigmatic dots later this summer. Just call me impatient. Scientists still don’t understand the nature of the spot cluster, but reflective ice or salt remain the strongest possibilities. It’s interesting to compare and contrast Ceres with Dawn’s first target asteroid, Vesta. Craters of every size dominate both small worlds, but Ceres shows evidence of a more activity in the form of relaxed crater rims (possibly due to ice deformation), landslides and collapsed structures. Dawn takes about three days to orbit at its current 2,700 mile altitude. It will continue to take photos and make science observations until dropping into a new lower altitude of 900 miles (1, 450 km) in early August. The latest views of Ceres’ enigmatic white spots are sharper and clearer, but it’s obvious that Dawn will have to descend much lower before we’ll see crucial details hidden in this overexposed splatter of white dots. Still, there are hints of interesting things going on here. 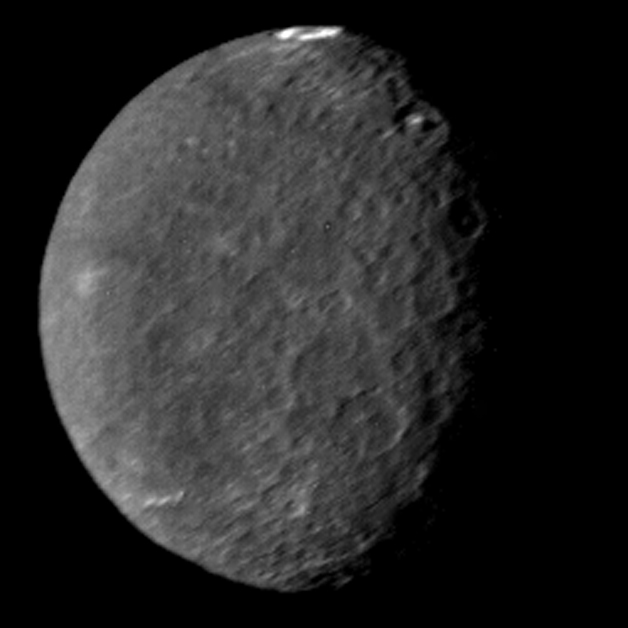 The latest photo is part of a sequence of images shot for navigation purposes on May 16, when the spacecraft orbited 4,500 miles (7,200 km) over the dwarf planet. Of special interest are a series of troughs or cracks in Ceres crust that appear on either side of the crater housing the spots. We’ve seen ice exposed by meteorite / asteroid impact before on Mars where recent impacts have exposed fresh ice below the surface long hidden by dust. In most cases the ice gradually sublimates away or covered by dust over time. But if Ceres’ white spots are ice, then we can reasonably assume they must be relatively new features otherwise they would have vaporized or sublimated into space like the Martian variety. Much has been written – including here – that these spots are the same as those photographed in much lower resolution by the Hubble Space Telescope in 2004. But according the Phil Plait, who writes the Bad Astronomy blog, that’s false. He spoke to Joe Parker, who was part of the team that made the 2004 photos, and Parker says the Dawn spots and Hubble spots are not the same. Could the spots have formed post-2004 or were they simply too small for Hubble to resolve them? That seems unlikely. The chances are slim we’d just happen to be there shortly after such a rare event occurred? And what happened to Hubble’s spot – did it sublimate away? Video compiled from Dawn’s still frames of Ceres by Tom Ruen. Watch as the spots continue to reflect light even at local sunset. Watching the still images of Ceres during rotation, it’s clear that sunlight still reflects from the spots when the crater fills with shadow at sunset and sunrise. This implies they’re elevated, and as far as I can tell from the sunrise photo (see below), the brightest spots appear to shine from along the the side of a hill or mountain. Could we be seeing relatively fresh ice or salts after recent landslides related to impact or tectonic forces exposed them to view? Let’s visit another place in the Solar System with an enigmatic white spot, or should I say, white arc. It’s Wunda Crater on Uranus’ crater-blasted moon Umbriel. The 131-mile-wide crater, situated on the moon’s equator, is named for Wunda, a dark spirit in Aboriginal mythology. But on its floor is a bright feature about 6 miles (10 km) wide. We still don’t know what that one is either! We don’t know exactly what those mysterious white spots on Ceres are yet, but we’re getting closer to an explanation. Literally. 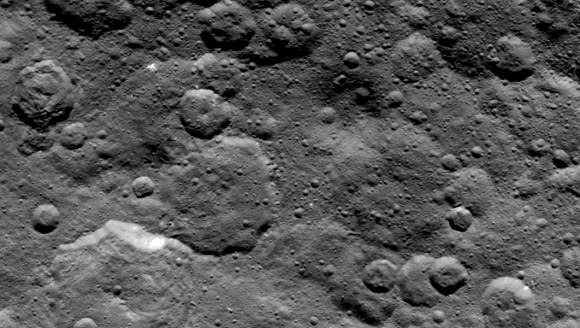 The latest images from the Dawn spacecraft taken a mere 8,400 miles from the dwarf planet Ceres reveal that the pair of spots are comprised of even more spots. Dawn recently concluded its first science orbit, making a 15-day full circle around Ceres while gathering data with its suite of science instruments. This past Saturday, May 9, its ion engine fired once again to lower the spacecraft to its second science orbit which it will enter on June 6. On that date, the probe will hover just 2,700 miles (4,400 km) above the dwarf planet and begin a comprehensive mapping of the surface. Scientists also hope the bird’s eye view will reveal clues of ongoing geological activity. Check out this great video compiled from Dawn’s still frames of Ceres by Tom Ruen. Almost feels like you’re there. There’s no doubt a lot’s been happening on Ceres. One look at all those cracks hint at either impact-related stresses some kind of crustal expansion. Geological processes may still make this little world rock and roll.